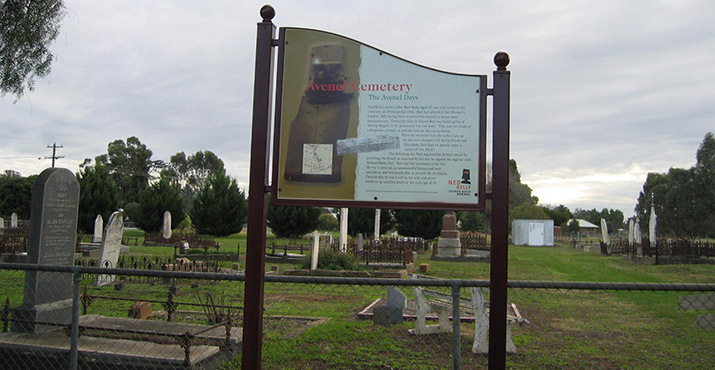 Ned Kelly and his family moved to Avenel when Ned was about 8 years old. They lived here for about four years. Sadly, Ned’s father, Red, passed away here, shortly after which the family moved north to be closer to Ellen’s family in Greta. 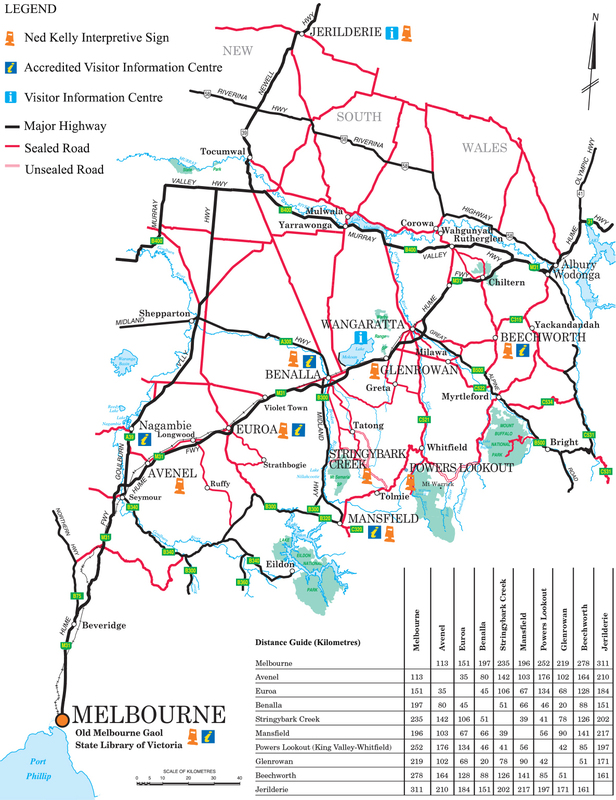 Avenel is 114 kilometres north of Melbourne. Its population is currently around 750. The area now called Avenel was settled in 1838 when pioneer Henry Kent Hughes leased 60,000 acres. He is said to have named his run after a village in England, that had been used in the title of a book that was popular at the time, ‘The Maid of Avenel’. The explorers Hamilton Hume and William Hovel had passed nearby when making the inaugural exploration south to Port Phillip Bay. 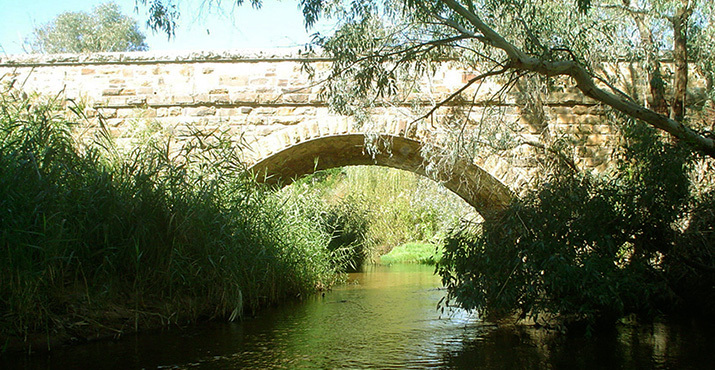 The creek here – later named Hughes Creek after the first squatter – was a popular overnight spot for drovers. 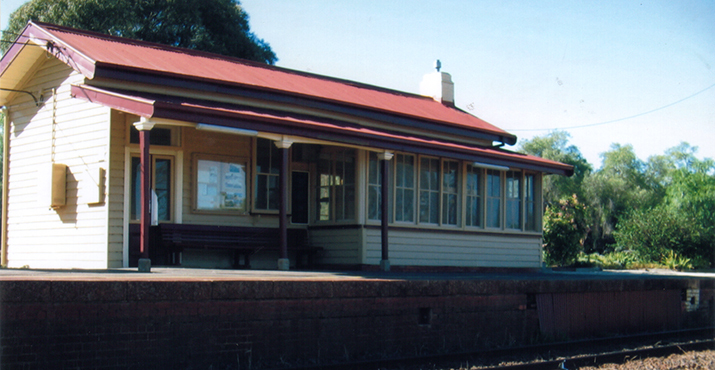 A post office was established here in 1858 and the overland mail passed through Avenel from 1839. 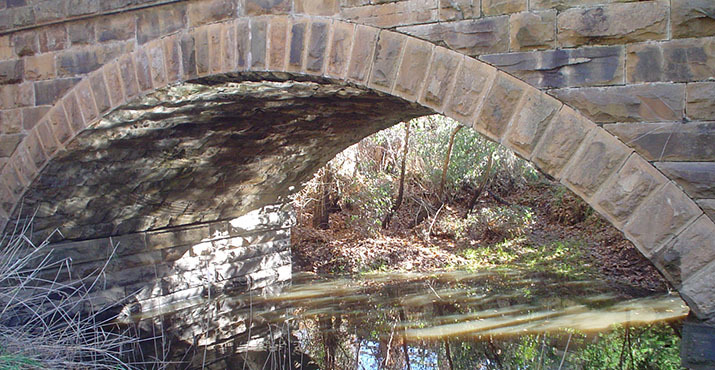 To replace the sandy ford a six-arch stone bridge was built in 1859.The Kelly family moved to Avenel in the early 1860s (when Ned was about 8). Red rented a 40-acre farm for £14 a year from Mrs Elizabeth Mutton (wife of William, one of Avenel’s two earliest settlers) and ran it as a dairy farm. 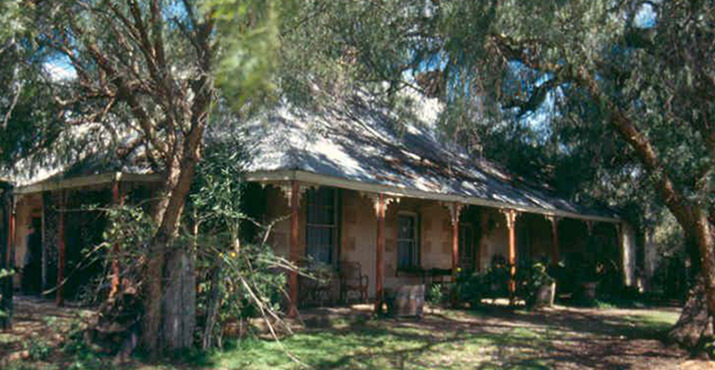 Ned’s youngest sister, Grace, was born here, increasing the family head count to seven, living in a simple slab hut with a bark roof. Annie, Ned and Maggie went to Avenel Common School and Ned was said to be an above average student. When he was around 11, Ned rescued Richard Shelton (aged 7) from Hughes Creek. The rescue took place about 150 metres downstream from the bridge, where Richard had been trying to cross on a fallen tree bridge. The boys headed back to Richard’s home at the Royal Mail Hotel to dry off by the fire. Ned wasn’t the first in his family to fall foul of the law – Ned’s father, who had been transported from Ireland to Australia for stealing two pigs, had to stand trial in Avenel Courthouse for cattle stealing, though he was later acquitted for the theft but charged with ‘unlawful possession of a hide’, for which he served four months. Red had killed a calf that wandered onto his property out of hunger and desperation to feed his family during the drought of 1865. What got him into trouble was not notifying the police, according to the decree, of his intention to slaughter an animal. Red’s health had been deteriorating over the years of struggle and it was in December 1866 that he died at the age of 46 of dropsy (oedema) possibly contributed to by heavy drinking. He was laid to rest in Avenel Cemetery. 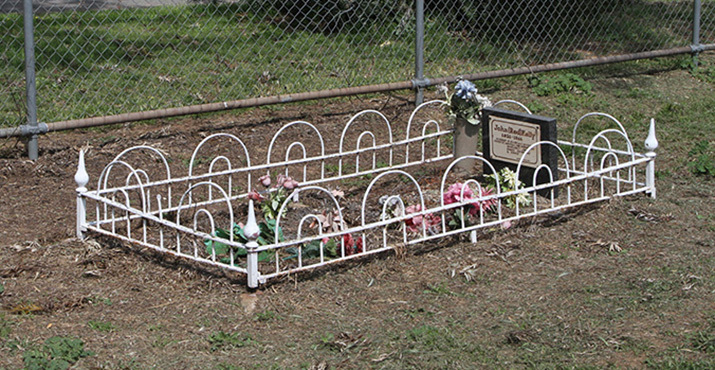 Ned became the man of the house at just 11 years old and registered his father’s death. Red was buried in an unmarked grave, though a headstone and grave has been marked off by the Avenel Historical Society. 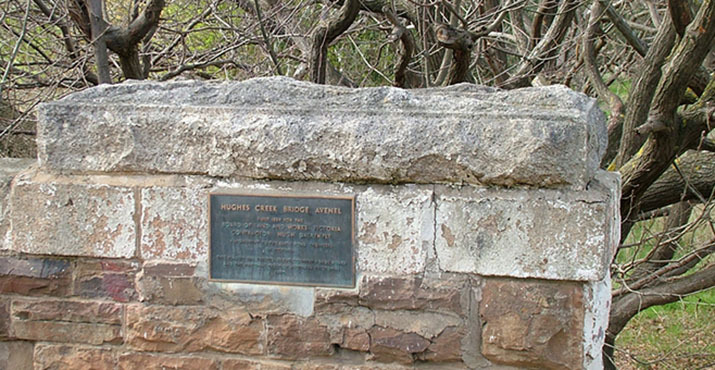 Hughes Creek and historic 1859 bridge – look downriver toward the spot that Ned rescued Richard Shelton. Stop for a pinic or BBQ and read the information boards on the Ned Kelly story. 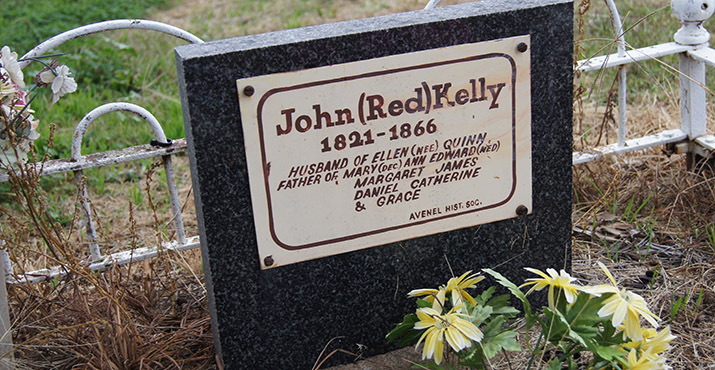 Avenel Cemetery – see the gravestone of Ned’s father John (Red) Kelly (though possibly not marking the actual burial spot) and brother. 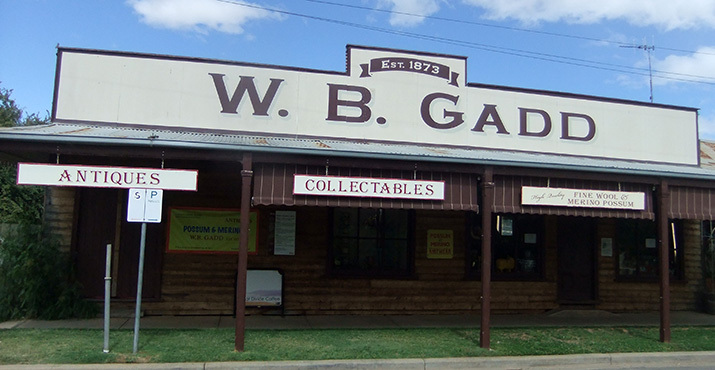 While you’re there, look out for the prominent grave of Arthur Bayley (1865-1896), who was credited as being the man who discovered gold at Coolgardie in Western Australia. Avenel Maze – five mazes for all ages as well as horseshoe pitching, boules and a 9-hole mini golf course, picnic spots and barbecues, Ned Kelly themed. 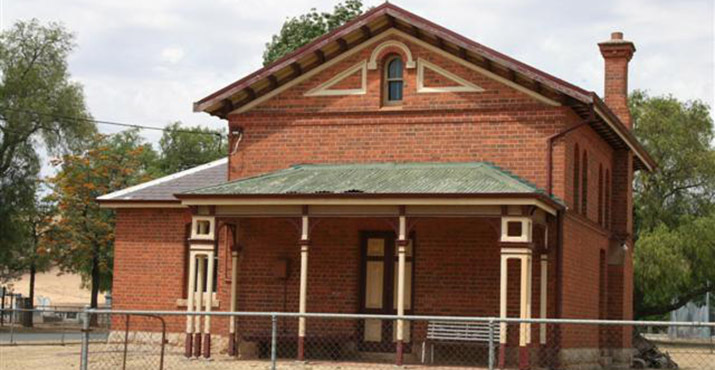 V/Line service to Albury – train station may be of interest to train nuts, a local volunteer group maintains it on Friday mornings, including the McKenzie and Holland lever frame; the station opened on 20/11/1872 but the 1881 building was replaced in the 1970s.